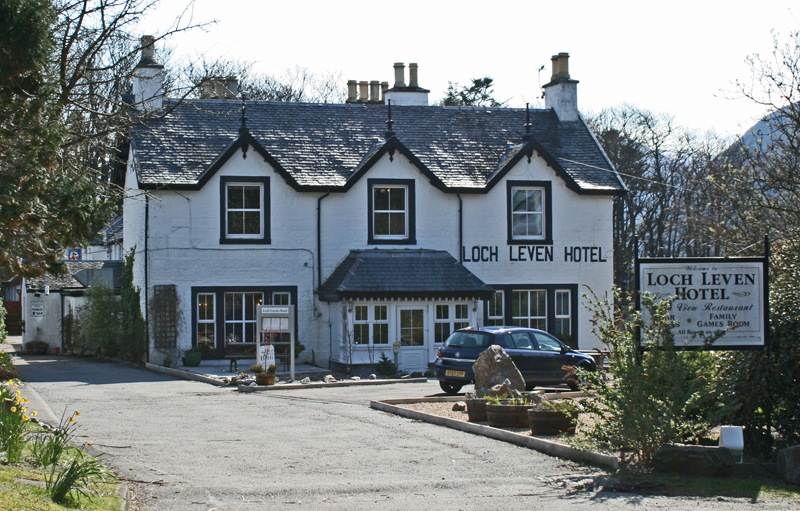 The same year, Mrs Mary Aust wrote a ‘Companion and Useful Guide to Beauties of Scotland’ in which she says that “The Inn at Bailechoalish is small, but it was neatly kept by a new landlady. In general it is ill kept.” This seems to support Garnett’s opinion of the previous year, but suggests that the new landlady may be trying to improve matters. There are further words of warning, however, as she also claims that it once took 11 hours to do the ‘about 26 miles’ from Oban to Ballachulish, thanks to the lack of people available to help load her carriage at Connel and Shian ferries. Sadly there is no mention of her experience with the Ballachulish Ferry. The Commission for Highland Roads and Bridges, under the supervision of Thomas Telford takes over responsibility for the Military Roads and also the Glencoe Drove Road. Subsequent to this, improvements are carried out on the route along Loch Leven and over the Ballachulish Ferry. In 1819, on their tour of Telford’s Works, Thomas Telford, his colleagues Joseph Mitchell and John Rickman and their friend the poet Robert Southey stayed at Ballachulish Ferry for the night. Because neither Inn had enough room for all of their party, they split into two groups, half staying on each side of the ferry. Telford was later responsible for the commission which saw Churches and Manses built at Creag Mhor, North Ballachulish (now demolished), Duror and Ardgour. The Clyde based Steamer Comet first sailed from Glasgow around Kintyre and on to Oban and Fort William in the summer of 1819. Whilst Ballachulish is not mentioned on the official timetables, documentary evidence shows that a number of often un-named request stops were made wherever there was a suitable pier, so it is possible that Comet stopped in the Ballachulish area that first year. The recorded date of construction for one of the Slate Arches is 1822. At various times, however, there appear to have been arches in at least three different places, and it is unclear which arch this date refers to, nor whether it was the initial construction or a reconstruction. One reference suggests it was the ‘Big Arch’ which stood between the surviving arch and the quarry entrance that was built in 1822. The arches were built to carry inclined tramways which lowered wagon loads of Slate from the upper levels of the quarry down to the shore for working and loading onto the waiting boats. The former Manse for the Church of Scotland in North Ballachulish was built to the commissioners design in 1829. The commission was under the supervision of Thomas Telford, who had already built a number of roads in the area, and almost certainly overseen some work on the road past the manse itself! This Manse related to the former parliamentary church at Creag Mhor, which was built at the same time and demolished in 1900, of which only the graveyard remains. The renowned artist William Turner visits the West Highlands by steamer and alights at North Ballachulish Pier. His notebook includes a couple of sketches of ‘Bala’, including one showing an arched bridge and house in the foreground with a landscape of the Pap of Coe, roughly as seen from St John’s Church. This suggests that the river there was previously spanned by a hump-backed arch bridge similar to the Brig O’Laroch, and probably dating back to the Drove Road as built in 1785/6. In April 1831 a cairn which stood on this spot was removed. The stone coffins within the enclosure were found underneath and had been left undisturbed. Neither bones, ashes nor any remains of antiquity were discovered. To preserve the sanctuary of the place, the surorunding wall was erected by Charles Stuart Esq of Ballachelish. The Slate is known locally as the Witches Grave, although the origin of this name is unclear. Other cairns in The Croft were cleared in the 1940s, with Croft Road believed to have been built on their site. James Johnson records that in autumn 1834 the road to Ballachulish is undergoing work with the Highland men working on it referred to as ‘Macadamisers’ referring to the process of road building invented by MacAdam which led to modern Tarmac. It appears that the work was on Rannoch Moor at the time, but implies that the whole road was being improved. Work was apparently progressing at the rate of a mile a month. St Mun’s Catholic Church was built in 1836, and is apparently unchanged today, apart from the addition of the later Priests House to the side, which is still not shown on the 1898 map. The original priests house is the rear part of the main church building. 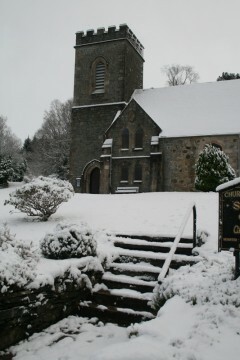 St John’s Episcopal Church on the shore of Loch Leven followed in 1842, and was later extended in 1888. The rectory is from the 1860s, although to the rear is part of an older house dating from 1838. Of all of the churches, it seems that St John’s is the only one to stand on an older site, with records taking the site back to 1770 when what is now (and perhaps was then) the hearse house was used by the Bishop as a chapel, and was indeed later consecrated as such. St Munda’s Church of Scotland is the newest of the three which opened in 1845 and was extended in 1881, when the tower was built. The Manse was built up the hill after the 1872 OS map. Other churches were the Free Church of 1874 which formerly stood opposite the School in School Brae and the Episcopalian chapel, known as the Banks Church which stood amongst the quarriers cottages in the vicinity of where the Village Hall now stands, and included a schoolroom. The original Free Church Manse is now Glen Morvern House at the end of Argyll Cottages. Churches and Schools – The Episcopal and Catholic churches are listed, but there is no school mentioned for Bailechelish or Laroch, the nearest being in Glencoe. By 1845 there were over 300 men employed in the Slate Quarries of Ballachulish. A century later there were just 20. 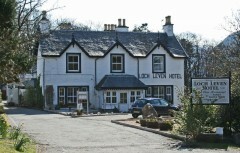 As with the Ballachulish Hotel above, there has almost certainly been an Inn or Hotel on the current site since the early 18th Century when the ferry started operating, if not long before. However, the current building appears to largely date from c1860. After perhaps centuries of ownership, the Stewarts left Ballachulish in 1860. It is unclear whether they sold up or relinquished the estate due to debts, or indeed whether some other factor saw the estate change hands. The remains of the pier at South Ballachulish appear to date from 1863, and were built by the Ballachulish Estate for the use of the estate. 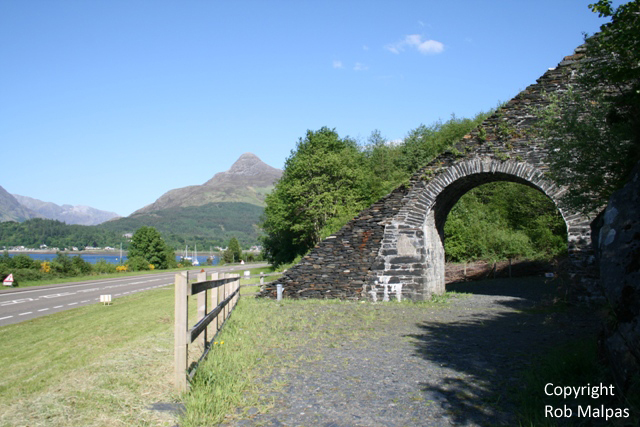 However, there are records of Steamers calling at Ballachulish prior to this, suggesting that there was an earlier pier either on this site or nearby. The house at the top of the pier has the appearance of being a waiting room or booking office for Steamers, and may be of a similar age. However, this is not confirmed as yet. 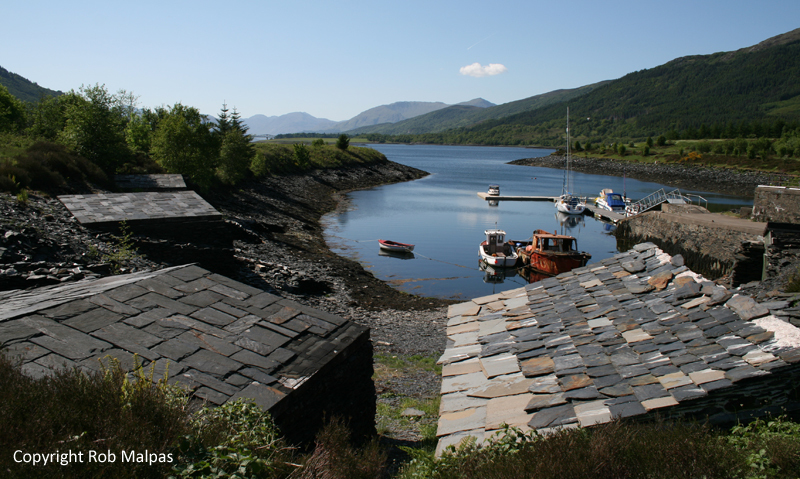 The unique slate boatsheds found along the shore of Ballachulish are first marked on the OS maps in the 1890s, but it is believed that they are older, or replace older structures, and were simply omitted from the earlier map, possibly due to the changing shoreline as the slate waste was dumped in the loch.